Washington/Melbourne/New York: Falling production in commodities from rice to milk is bad news for everyone except investors. 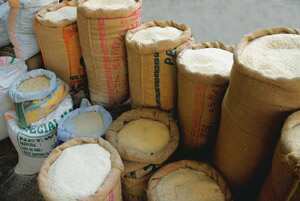 Rice may surge 63% to $1,038 (Rs48,475) a tonne from $638 on Philippine imports and a shortage in India, a Bloomberg survey of importers, exporters and analysts showed. The US government says non-fat dry milk may jump 39% next year, and JPMorgan Chase and Co. forecasts a 25% gain for sugar. Global food costs jumped 7% in November, the most since February 2008, four months before reaching a record, according to the United Nations Food and Agriculture Organization, or FAO. Farm prices this year lagged copper futures that doubled and oil’s 57% increase. A recovery from the recession would spur food demand and boost costs for buyers of commodities but increase the number of hungry people, which the UN says already exceeds one billion. Agricultural commodities will be a great investment in the next three-five years, said Oliver Kratz, who manages $10 billion as head of global thematic strategy investments at Deutsche Bank AG’s DB Advisors in New York, including $3 billion in agriculture. But for those who can’t afford to pay more for food, there’s the painful risk of hunger, he said. Expanding populations and higher incomes are boosting consumption in China and India. China’s milk demand is recovering after domestic supplies were tainted with melamine, a chemical used in making plastics that killed at least six babies and sickened almost 300,000 children. Droughts in India and Argentina and typhoons in the Philippines have reduced output. Inventories are extremely low in a number of grains markets, Barclays Capital said on 10 December. The prospect of a further bout of food price inflation in 2010 cannot be ruled out since many of the factors that pushed up prices in 2007 and 2008 are still a feature. Stockpiles of corn and rice will drop before the 2010 harvest for the first time in three years, US department of agriculture (USDA) data shows. The International Sugar Organization forecasts a second straight global supply deficit in the year through September 2010, and USDA predicts stores of the sweetener will drop to the lowest level since 1995. The tendency for food prices is up, not down, Paul Polman, chief executive of Unilever Plc, the largest consumer product firm after Procter and Gamble Co., said in a recent Bloomberg Television interview in Copenhagen. “We need to be sure that we have the food supply, that we don’t waste, and that we continue to get increasingly efficient means to get that food to the consumers," Polman said. Economic growth may revive shortages, according to Josette Sheeran, executive director of the UN’s World Food Programme. “Volatility in price and supply are with us for the predictable future," she said. Global production of rice, the staple for more than half the world, has lagged demand in four of the past eight years, USDA data shows. Rising consumption is expected to erode stockpiles by 41% to 85.9 million tonnes (mt) in the 2009-10 marketing year, down from a record 146.7mt in 2001-02. Rice may exceed $1,000 a tonne as dry El Nino weather, caused by a warming of sea waters in the equatorial Pacific Ocean, shrinks output and the Philippines and India boost imports, according to Sarunyu Jeamsinkul, deputy managing director at Asia Golden Rice Ltd in Thailand, the largest exporting nation. The risk of accelerating prices may be muted by healthy gains in inventories, including wheat, according to FAO. Supplies in warehouses are enough to meet around 23% of global demand, compared with 19% two years ago, FAO said last week. Global wheat stockpiles on 31 May are expected to jump 17% to an eight-year high of 190.9mt, after production last year reached a record 682mt, USDA said on 10 December. Food output will need to rise 70% in the next four decades as the global population expands to 9.1 billion in 2050 from 6.8 billion, FAO estimates. Seven nations in sub-Saharan Africa, the world’s most famine-prone region, will see per capita income fall next year, according to the UN, fuelling an increase in hunger. Catarina Saraiva and Millie Munshi in New York, Gavin Evans in Wellington, Rudy Ruitenberg in Paris, and Whitney McFerron and Jeff Wilson in Chicago and Juan Pablo Spinetto in London contributed to this story.